Please read all details below, here is a quick summary. Item has not been tested, condition is unknown. We do not have the ability to test anything, we do offer a 30 day return from date of invoice for the equipment. We are located at 20001 Euclid Ave, Euclid, Ohio 44117 - just outside of Cleveland, Ohio. Please see below for full listing details. BEFORE PURCHASING, PLEASE READ ALL TERMS. Any conditional notes will be listed in the additional information. Item is subject to prior sale. This item is located in our 12 acre indoor showroom at. Our store hours are Monday-Friday 8am-4pm EST. ALL TERMS ARE CONCURRENT WITH HGRINC. (c) Truckload and Partial Truckload: HGR can assist you in setting up truckloads or partial truckload loads flat bed, step deck, double drop, etc. HGR loads for free, but does not assist in strapping or securing the items. Government regulates exports of U. Products, technology, and software, including the movement of U. Origin commodities between foreign countries. Controls are used to regulate the export and re-export of dual-use items; items that have both a civilian and military application. These controls are in place to prevent the distribution of dual-use items that can compromise national security. Certain HGR products may be strictly controlled to prevent diversion to those interested in proliferating weapons of mass destruction or terrorist supporting entities. Penalties for violations of U. Export control laws and regulations may be imposed by law. Diversion of any products contrary to United States law is prohibited. Skids oversized will be subject to an additional charge. Storage charges are due on the first 1. Of the month with a 5 day grace period. Day of the month, items will be considered abandoned and the customer forfeits the rights to the item or items. There will be no exceptions. Packing may include bubble wrap, packing paper, insta-foam packaging, or other forms of protection for securing the item. We can NOT use other UPS accounts other than our own. In the event you determine anything is damaged, you have two options 1. Sign the BOL as damaged, and accept that the carrier is only liable for 10 cents per pound and that will be the MAX you will receive back. In either case, please take as many pictures of the damages as possible and make notes of the damages. HGR is not liable for any damages caused by carriers. Our return rate is well below 1%; please ask questions, assumptions can be costly. HGR Industrial Surplus (HGR) sells all products as is. HGR shall have no other obligation or liability, direct or indirect, of any kind, including liability for special, incidental or consequential damages. Prices are subject to change. 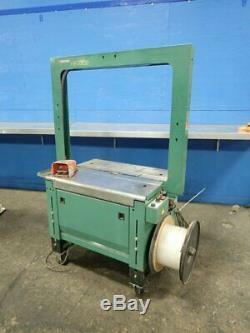 The item "SIGNODE HB-4300 STRAPPING MACHINE 36 X 31 X 9-10.5 12121200125" is in sale since Wednesday, February 13, 2019. This item is in the category "Business & Industrial\CNC, Metalworking & Manufacturing\Other CNC, Metalworking & Manufacturing". The seller is "hgrindustrialsrpls" and is located in Euclid, Ohio. This item can be shipped to North, South, or Latin America.